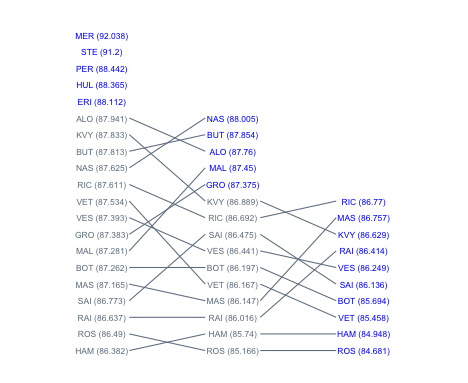 F1 Data Junkie: F1 Spain - Qualifying progression chart (corrected) and Q3 "grid"
F1 Spain - Qualifying progression chart (corrected) and Q3 "grid"
If we use a time based y-axis, we can see a couple more things. Firstly, how the cars are grouped in terms of time, perhaps revealing something about qualifying strategy and doing "just enough"? 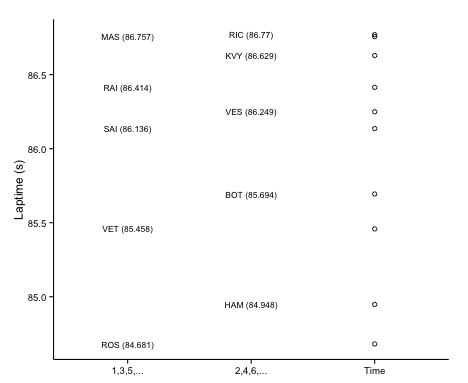 Secondly, whether improvement was made in laptime going from one qualifying session to the next: lines that slope upwards left to right show a deterioration in laptime. If you imagine replacing an upward sloping line with a horizontal line it shows you where a driver would have qualified had he repeated his earlier, better laptime. 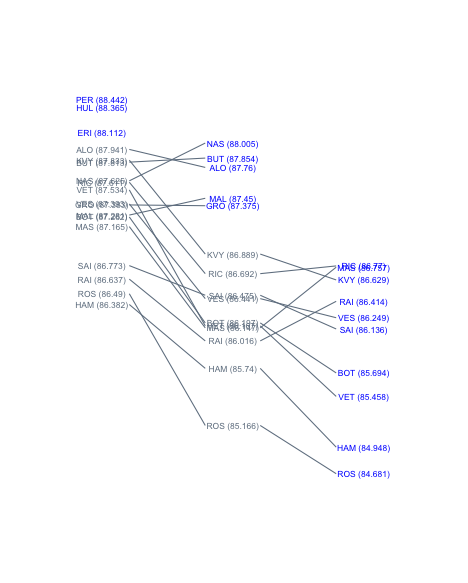 The problem with using the vertical laptime axis is that there is a high likelihood of labels colliding. The directlabels R package provides several utilities for managing label layout - I wonder whether the apply.method function could be used to adjust the label positions so that they can be clearly read. In the chart below, symbols are used to depict exactly the actual laptimes on a real number scale; in the above chart, the line endpoints arguably perform a similar role?